No two recessions are ever the same. One of the best indicators of a possible recession on the horizon is the inversion of the American Treasury interest rate yield curves. Inversion means the yield on short term rates are abnormally higher than long term rates. With Jerome Powell, the FED chairman, publically committed to another two .25% interest rate hikes this year, it is highly probable that by year end the 2/10 year yield curve will have inverted. (Currently the spread between the 2 year and 10 year yield is only .26%). In the recessions of 2000 and 2008 the American economy experienced severe recessions within 22 months and 24 months, respectively, upon yield curve inversion. With this perspective in mind I hear a lot of punters saying they are not too worried, short term, believing that there is plenty of time to exit the market and protect the wonderful profits made during this bull market. However, given the mature nature of this stock market (it commenced in March 2009) and taking cognisence of the potential interest rate inversion I have advised student clients, particularly those with substantial funds, to take a sizable percentage of their capital out of this market and place it in cash and I have told those folk nearing retiremnt to go totally to cash, should inversion actually occur as expected. My main reason for maintaining this view is due to the changed nature of the market as a result the explosive popularity in “basket investing” through exchange traded funds. This I reckon will be a recurring “mantre” of the next recession, for recessions are never the same and always have their unique “footprints”. The defining feature of the next recession, I think, will be multi flash-crashes due to collapsing market liquidity and the “sameness” of ETF investment portfilio structure. In the circumstance of flash-crashes sell-stops will be of little benefit. There wil be severs gap-downs, with no actual market to fill sell-stop trigger points. The lack of traditional “market makers”, quant trading, high frequency trading and algorithim trading will all exacerbate the problem. Due to the fact that technical analysis programming has become so ubiquitous everybody, (or to put it more honestly, every trading computer bot), will “desire” to sell the same basket of equities, contained in the same popular ETFs, all at the same time. Result: no market, period. However, there is a sunny side to this historical observation. I have always told students that recessions are wonderful things for any investor who is prepared. Being prepared means having a cash position to take advantage of market price action once the panic is over and prices have stabilised. Warren Buffit exemplified this concept in a recent Berkshire Hathaway Newsletter. To paraphrase him he said: “in recessions when valuations fall and value becomes evident we do not go out investing with a spoon, we use a bath tub”. 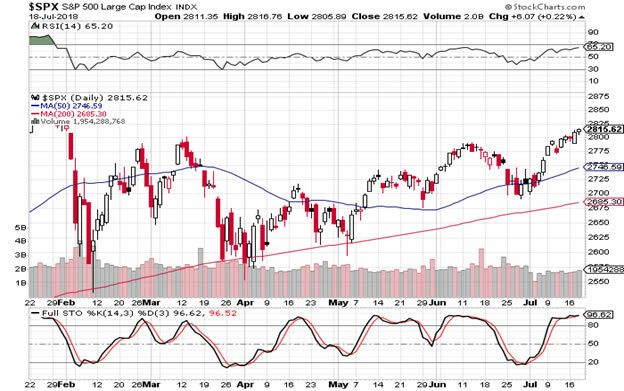 The market is solidly repairing the damage done by the New Year “correction”. 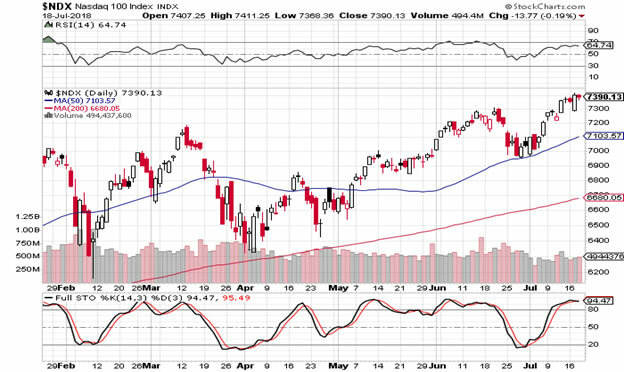 The NASDAQ and the Russell 2000 have reached new highs and the S & P 500 has finally taken out the July highs. The Dow industrials and the Dow Transports have not done so yet but are making a strong effort to follow suit. The 14 day and 28 day stochastics we are giving over bought reading, thus it would be reasonable to get a pullback of some degree but I think technically the markets are building up for a strong year end. 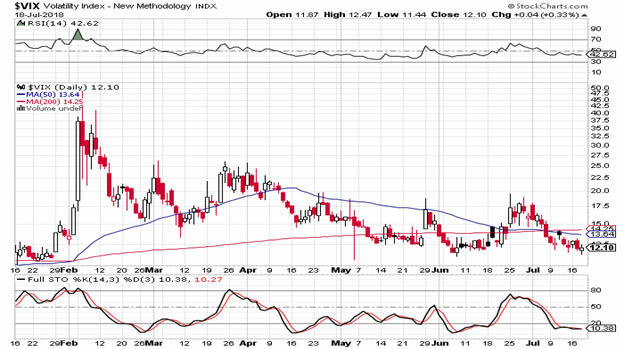 The one important negative factor to bear in mind is that the VIX is hard on the floor of its trading range, so an explosion upward is fairly likely at some stage thus bringing with it strong volatility and price contraction. The important thing is that it that when this occurs the technical damage is contained. If not and similar breakdowns occur like that of February last what with rising interest rates, a strengthening dollar, quantitative tightening, escalating trade wars and potential Brexit chaos growing in Britain, Ireland and greater Europe, a short-term bear trend could easily morph into something more destabilizing. 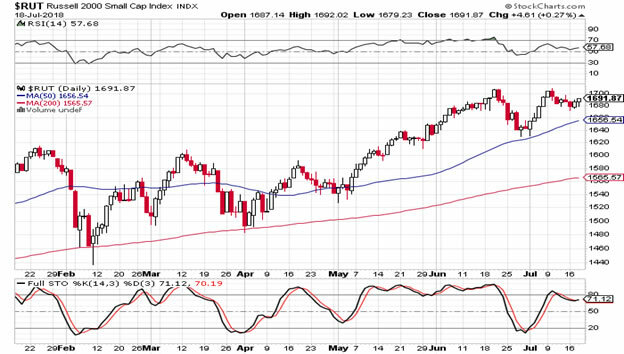 Chart: S & P 500: Daily.